To book online, click on the button above. Round trip transportation on a deluxe motor coach equipped with a bathroom. 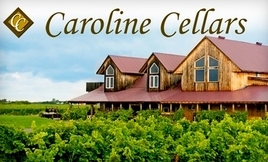 Private food pairing & wine tasting at Caroline Cellars winery. You get 4 wines and 4 savoury hors d'oeuvres made especially for pairing with wine. Listen to experts who will present information on the best way of pairing wines with food. 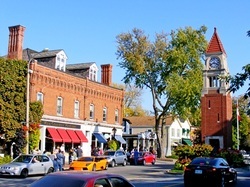 Free time in Niagara-On-The-Lake to have some lunch and explore the quaint shops & cafes. Ice wine tasting at The Ice House Winery. You get to try a white ice wine, a red ice wine and an ice wine slushie! Tour at the Chocolate F/X Chocolate Company. You get a brief tour of the plant from the viewing windows, try lots of free chocolate samples and of course you have an opportunity to shop in their extensive store. Private evening dinner for our group. We have a 7 course menu lined up just for our group that should satisfy even the heartiest of appetites. $129 per person, tax extra. We have 4 pickup locations in the Toronto area. Hwy 400 & Hwy 7, Woodbridge. York Mills Subway Station, Toronto. Hurontario & Hwy 401, Mississauga. Guelph Line & QEW, Burlington. We leave at approximately 8:00 AM. Actual pickup times vary by stop and will be sent out in the final email to all registered attendees, 2 days before the trip. We return to Toronto at approximately 9:00 PM. Sorry but this trip is restricted to adults 19 and older. Do you enjoy any of the following? Wine, Icewine, Wine tastings, Chocolate, Day-trips, Elegant Dinners or Niagara-On-The-Lake ? If so, this is going to be an awesome day for you because we get to do ALL of the above. Join us for our exciting upscale day-trip to Niagara-On-The-Lake. After our wine tasting session, we will now proceed to drop you off on Queen Street, the main street in the village of Niagara-On-The-Lake. You will have about 2 hours of free time to have some lunch and explore the quaint shops and cafes. The Ice House Winery holds a unique position in the wineries of Niagara-on-the-Lake. It is the only winery that exclusively makes Icewine. The Ice House is the proud recipient of 3 Internationally Famous Monde Selection Grand Gold Medals and in 2010, winery's Icewine was selected as Canada’s Premium Gift for the celebration at the Golden Globes Oh Canada event. 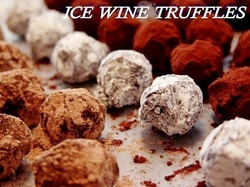 We will be trying 3 ice wines -- a white, a red and an ice wine slushie. A slushie you ask? Yes, a visit to The Ice House Winery is never complete without a Northern Ice N’Icewine Slushie, which is exactly what it sounds like, a refreshing, yet sweet and delicious chilled treat. Do you like chocolates? Well, are you in for a treat! We are now going to visit Chocolate F/X in their brand new chocolate factory in the lovely hamlet of St. David's. Here, you will get a tour of their plant from the viewing gallery and lots of free samples to try. And of course an opporutnity to shop for chocolate and candy confections in their extensive store. And finally we end up at our last stop, our dinner in a very elegant restaurant with a vibrant atmosphere and cuisine inspired by Tuscan cooking. We will be dining family style with large platters placed in the centre of each table, just like Mama does it back home in Italy. Help yourself! Our menu this evening is very extensive and has 7 courses! Just wait till you try the crab dumplings, they're awesome! Options will be available for vegetarian and gluten-free diets. After we finish our meal amidst lots of laughter and conversation and mirth and merriment, we alas have to board our bus and head back to Toronto. Is it just me or do some of you also feel a slight pang of regret when a great day trip comes to an end? or click here for online contact form.